New York Giants wide receiver Odell Beckham runs after a catch against Philadelphia Eagles cornerback Jalen Mills. The Eagles aren't the only ones working on a short week as they prepare to face the Giants on Thursday Night Football — we're also trying to cram the same amount of Birds coverage as a full week into these four days — so I'm not going to waste your time with a long intro here about the importance of this Week 6 matchup between two NFC East rivals. That's the current total being offered at Bovada, and it just seems a little low for me. Sure, the Eagles have yet to score more than 23 points in a game, and the Giants haven't been much better. While they've hit 27 and even 31 last week against the Panthers, they've scored just 104 total points on the season, which is one better than the Eagles. 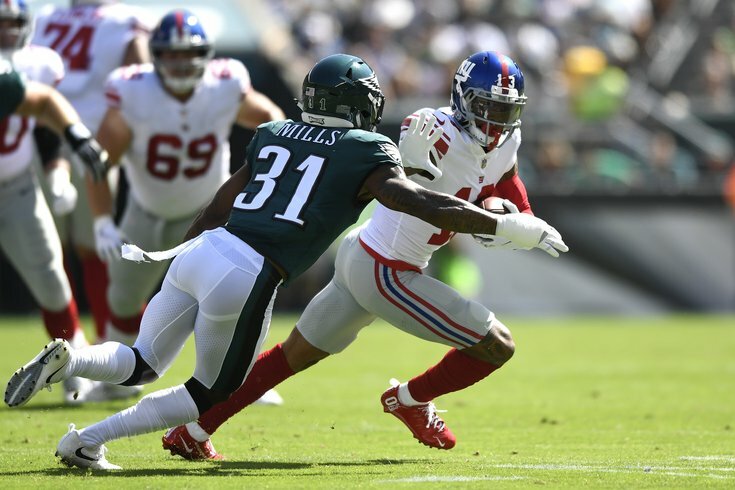 The Eagles scoring defense has been much better than the Giants, who rank in the bottom half of the league in points allowed, however, the Eagles secondary against Odell Beckham and Co. is a scary proposition. I predicted a 27-26 final, so I'm sticking with the over. However, it might be worth keeping an eye on the weather as the forecast is calling for rain. The Eagles have allowed at least one 100-yard receiver in four of their first five games this season, and based on what we've seen in recent weeks, there's no reason to believe that's going to stop tonight — of course, a pass interference call or two on Jalen Mills could mess this all up. In his career, Beckham has feasted against the Eagles. In seven games against the Birds, the Giants wideout has caught more passes (50) for more yards (603) and touchdowns (6) than he has against any other opponent. That being said, only twice has Beckham recorded more than 100 yards receiving in a game against the Eagles, but in his only matchup last season, he caught nine passes for 79 yards and a pair of touchdowns. This season, Beckham is averaging over 92 receiving yards per game, so there's a very good chance the Eagles allow another 100-yard receiver tonight, especially now that Corey Graham has also been ruled out for this one. And if that's the case, there's even better chance that his initials are OBJ. In three games since returning from a torn ACL, Eagles quarterback Carson Wentz has been sacked 12 times — and that's not even counting all the other hits he's taken. On what is expected to be a wet field at MetLife Stadium, the Eagles must do a better job at protecting Wentz on Thursday night. Unfortunately, that task may have just gotten a little more difficult as Lane Johnson (ankle) was a late addition to the team's injury report. If he can't go, Halapoulivaati Vaitai will get the start in his place at right tackle. That's not good, especially with Olivier Vernon expected to return to action for the Giants. There's been a lot of talk this week that Doug Pederson hasn't been running the ball enough. And while that was certainly true against the Vikings — they ran the ball just six times in the first half — there's usually a reason why a coach decides to tilt his game plan in one direction or the other, and often it's a result of circumstance. Well, the circumstances currently surrounding the Eagles' backfield don't inspire a ton of confidence that Pederson will return to a more balanced game plan in this one. Jay Ajayi (ACL) is done for the season. Darren Sproles (hamstring) is still out. Corey Clement is just returning from a quad injury. And Wendell Smallwood, well, someone we still never know what we're going to get from the third-year back. Still, the Eagles average 25 carries per game, and hitting that number tonight could be the key to picking up a win. So far this season, the Birds are 2-0 when they run the ball at least 25 times and 0-3 when they run it fewer than 25 times. One is all you really need.